I love Cristen Pascucci. And I love every other person in this world who is fighting to Improve Childbirth for women and babies around the world. I really do. They share my same passion so I know that I am not fighting alone. Christen wrote the blog You’re Not Allowed To Not Allow Me and I just love it! Everything in it I have said, thought and believe myself. I have been a midwife for 22 years and so much of my work is about helping women understand that they are autonomous, capable people and the best decision-makers for their children. That is why it is so hard for me when my clients are told they aren’t allowed to make any number of reasonable choices in the hospital because of POLICY. They are not encouraged to exert their autonomy at all in the birth process. I hate to see women forced to submit to interventions in their labor even when they are pretty sure that they don’t need them and REALLY sure they don’t want them. Things like an IV access-just in case something goes wrong or admission bloodwork or continuous monitoring. After women are told the reasons for something like the IV, they generally consent. Intravenous fluids are reasonable when getting an epidural, when keeping no oral fluids down in a long labor, if they have difficult veins to access or when the provider suspects a postpartum hemorrhage. But they don’t always consent to an IV if it is just for because it is the routine admission procedure. The insertion of the IV catheter is painful, requires bright lights and impedes use of an arm. Pain, bright lights and the inability to use one’s body naturally disrupt the progress of normal labor. The actual fluids, often given in very large volumes, run counter to the natural dehydration that occurs in most labors. This dehydration causes hemoconcentration of the woman’s blood (more cells, hormones and immunoglogulins compared to water in the blood) and brings more oxygen to the placenta to assist the fetus in tolerating the stress of labor, steadily increases oxytocin to aid in the progress of labor and protects mother and baby from infection. When women are giving birth, they intuitively don’t WANT the IV. And in many cases, they don’t NEED it. I want women to know that what they want and need in labor is usually NOT counter to what their baby wants and needs! How do we come to a place where women and their providers are working together as a team toward the best possible outcomes? Outcomes where not only do the mother and baby survive the process but the mother and baby’s mental and physical health are optimized. Women need providers that trust birth and they need providers that they trust. A woman should be able to question the decisions being made and she deserves to be part of all non-emergent decisions. Of course there are times when decisions need to made quickly and the woman needs to depend on her provider as the expert to care for her appropriately even if there is not time to discuss. This is where the trust comes in. Providers who trust the process of birth to go well are hard to find. It is much more common among midwives but is occasionally found in obstetricians. When a woman has a provider who has taken the time prenatally to get to know her client and to let herself be known, the woman is more likely to receive HUMANE care. This trust RELATIONSHIP makes it very difficult to tell a woman she can’t do something she wants, such as get out of the bed in labor or labor without a fetal monitor strapped to her stomach. Because all providers know the evidence does not support that kind of care, it is just easier to run a busy labor unit with women in bed being monitored continuously. Knowing that the foundation of their relationship is trust in the normalcy of birth helps the woman know that her provider is not seeing danger where there is none. Want to Make a Positive Difference in How Women & Babies are Treated? Come to Our Improving Birth Rally! 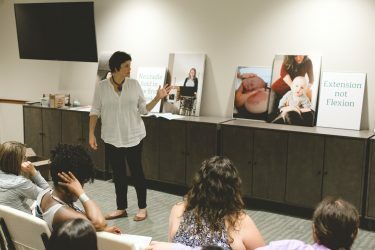 Our Improving Birth Rally, to be held on Labor Day, is addressing the need to HUMANIZE the birth of our children and to fully recognize the far-reaching impact of pregnancy and birth on the individual involved, their families and the world as a whole. Read Christen’s blog and then join us on Labor Day-whether you had a birth you were happy with or not, or whether you have had a baby or not. You don’t need to be part of the Midwives of New Jersey’s practice, you don’t even have to be a woman. Just be someone who sees the importance of autonomy in childbirth and join us!